After dragging a url from firefox into DOPUS folder, OPUS jumps from the active folder to the desktop. How do i fix this? 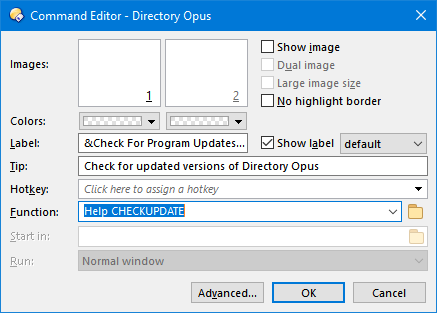 Also, when I try to have OPUS check for updates (within the Help Menu), NOTHING happens. I now find that I am 5 versions BEHIND. It sounds like Firefox is opening the desktop folder in a new window. If you turn off Explorer Replacement do you get an Explorer window opening instead? Do you mean literally nothing? No window comes up at all? If you go to Settings / Customise and then right-click on the Check for Updates command in the Help menu and choose Edit, what command is it set to run? 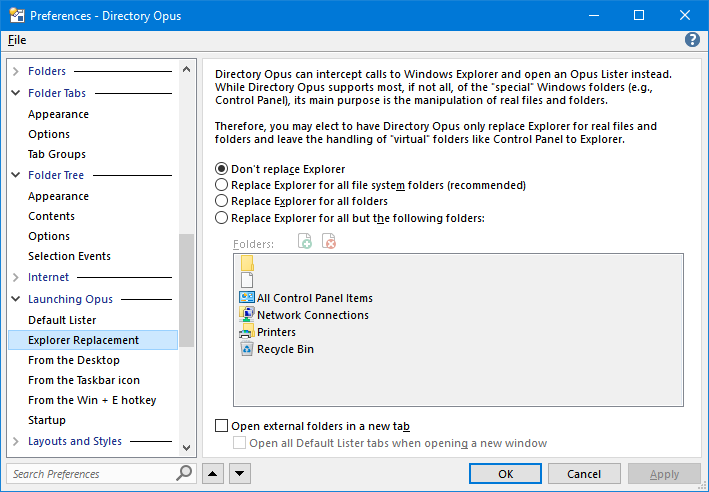 Drag into OPUS - I may not understand what you're saying about opening in a new window, but from what I can tell, OPUS jumps from the directory I just dragged the URL into to the Dekstop - no new windows are evident. How do I turn off Explorer Replacement? I tried dragging the same URL from Firefox into the same folder as before, but within Windows Explorer, and did NOT have the problem of Windows Explorer jumping from the active folder to the Desktop. So, it seems to be something to do with Opus. The first thing I'd do is try downloading the latest version, in case that fixes either problem by itself. We're about to release 12.14 in the next few hours, so you might want to wait for that, then download it via the post that will appear in the New Releases area here at the forum. When you run the update checker, does the lister lose focus (e.g. titlebar close button changes from red to white)? Do you have anything installed that changes the look & feel or behavior of windows? Or anything that automates e.g. closing windows or responding to prompts or similar? the lister does NOT lose focus. To my knowledge, I have nothing installed (e.g., "Fences") that changes the look & Feel. And nothing that automates responses or replies to prompts. After clicking Help > Check For Program Updates, please create a manually generated process dump and send it to us. We might be able to see from that where thing are getting stuck. OK, I just sent an email from Dropbox with the share link to the dump file. We haven't received any email so far. Was it sent as an actual email, or to a dropbox account (which won't exist if so)? I just resent the link. Apparently, there was a problem when I tried sending the link from within Dropbox. did you get the dump file? This only works with English versions of Opus. It's a quick tool that should find the Opus News window and force it to be visible. That may then reveal what is going on with the updater. Please try that and let us know what happens. Is something blocking Opus from accessing the internet? That looks like what's breaking update checks at least. Check firewall and similar software.